These 3 cards were made in the same similar style. My inspiration comes from Christina! My husband and I have done nature photography for years, and I have been doing cards now for about 3 years. I have used the Spellbinders dies. 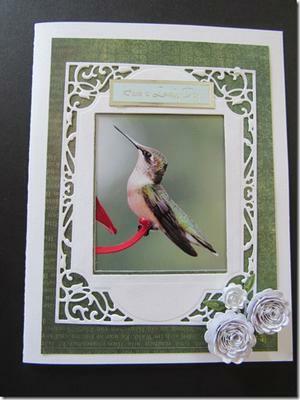 I used Timeless for 2, and the hummingbird was made with Devine Eloquence Die. 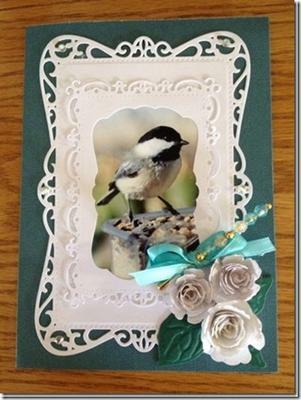 The card sizes are 4.5 x 6.5 for the chickadee and the groundhog, and the hummingbird was a 5 x 7 inch card. I used whatever cardstock is on sale! 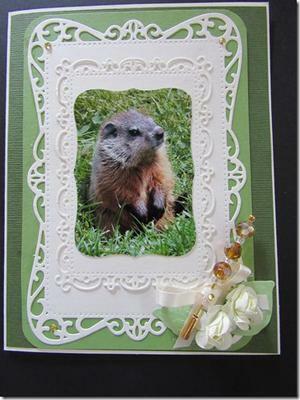 The flowers were made from Spellbinders Bitty Blossoms, but the groundhog flowers were commercially premade. I decorated my blossoms with glitter Stickles. I made my own bows, and learned how to do the hatpins from Christina. I use whatever beads I can find inexpensively. My little girl and I enjoy working on cards together. She is a big fan of digis and watercolor. I have done art for many years, and enjoy working with Copic markers in particular. We have also taken many flower photos which I will be incorporating in future cards as well. I enjoy giving the cards to family and friends. It makes me so happy to see people smile! Such pretty cards would be sure to make any one lucky enough to get one smile. They are all lovely and you have made three very personal greetings cards. Incorporating your photography skills into them makes them even more special and you are so lucky to have such wonderful visitors to your own back garden. I love that you combined your nature photos with the dies and embellishments. I'm definitely going to try something like this. Thanks for sharing. Good Morning Sue. Beautiful, Beautiful Cards! I am familiar with all these critters, as well, as we live in the woods and a lot of them are at our bird feeder. To get a photo of a humming bird is a real treat and accomplishment! All of the cards are just lovely, but I think my favorite (and that was hard to pick) is the Chickadee. The design and layout stands out to me. Thank you so much for sharing. You've inspired me! I love the way you displayed the photos. Great job!